I have run thirty-one 5Ks, and on Saturday, July 18th, I ran number thirty-two. Every 5K I run is a special experience and, typically, for a special cause, and this one was no exception. 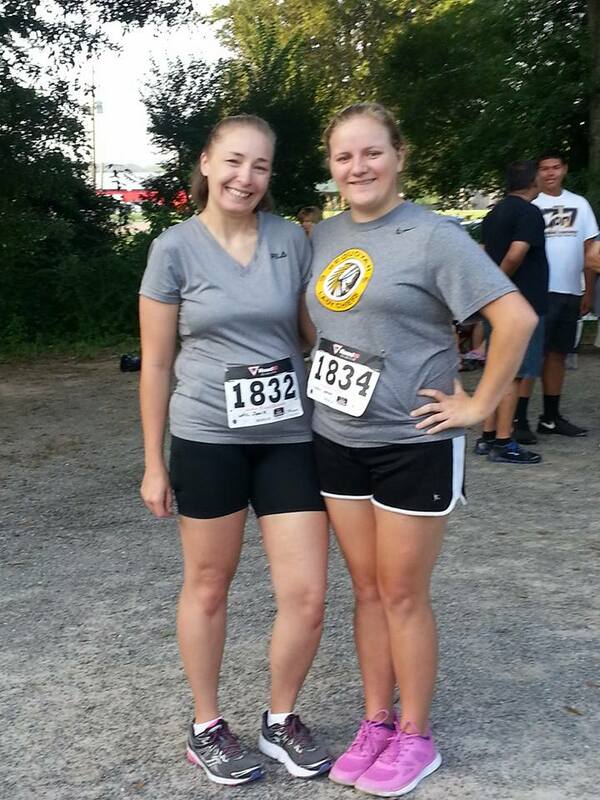 I ran this 5K with a former student of mine (Jordan) who just graduated this past May, and this was her first 5K! Jordan is one of those students (sister in Christ, now friend, and occasional babysitter ;-) who holds a special place in my heart. To begin with, she took every course I've ever taught (10th lit/comp, American lit/comp, and public speaking), and, more importantly, she was a tremendous encouragement to me as a teacher. Truly, there are many teachers she daily blessed with her kind words and inspiration. Let me give you an example. 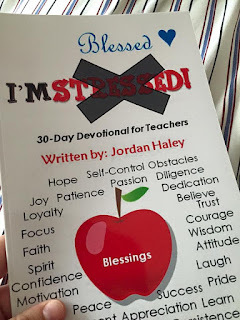 The last thirty days of school, Jordan showed up each day in my classroom with a devotional she had written as a way to encourage her teachers as the school year came to a close. What high school senior takes the time to do such a thing?! One with a kind heart and Jesus as her King! As a way to continue to spread the love, she printed up copies of her devotions in a book that she sells for small fee. Jordan is taking the proceeds from the sale of these devotions to sponsor a child in Guatemala (where she recently went on a mission trip). Contact her if you are interested in buying a copy for a teacher you would like to encourage! Her daily devotions are great! Okay. 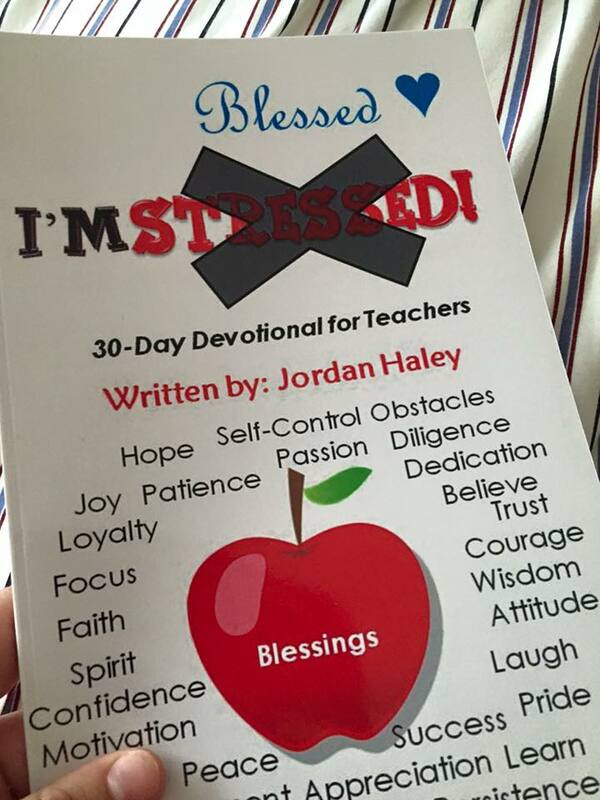 So I have written a devotional for teachers, called I'm Blessed. I will be putting in orders for the next couple of months and I wanted to put it out there for my fellow teachers/friends! I have really enjoyed writing this devotional. I started writing it about a month ago and I was giving a devotional-a-day to a few of my teachers, since I am about to graduate. They all loved it and told me I should publish it, so I am! They are only $8! If you have any questions, or want to place an order, message me! Or email at blesseddevotional@gmail.com. Thank you so much! I had a great time running with her! Since it was her first 5K, I let Jordan set the pace and played the role of running buddy during this race, and I think she had a good race time for her first 5K as she finished in 48:06. Jordan and I chose to run this 5K because it was in memory of a man who lost his life while bike riding - a man who helped coach the cross country team at the school I taught at and where Jordan just graduated from. And it just so happened that he was the father of a former student of mine. That's why we had to run this particular race together above all others offered this month. I didn't get to see my former student at the event, but if she looks at the names of those who ran that day to honor her father, I hope she sees my name and knows I was thinking of her. My students - all of them, even the most difficult ones - have a special place in my heart. I only ever wish them the very best once they leave my classroom. And some, like Jordan, keep in contact with me, and some I never hear from again. Some leave and experience great success (love hearing about those! ), and some leave and experience tragedy or pass away all too soon (hate hearing about those!). As I get ready to start a new school year, now at a different school, I am eager to connect to my new students. I will pray for them, and we will run this race of life together for the next ten months. Part of my prayer for my students is that I can in some small way impact their lives for the better. Sure, I want to make them better readers and better writers, but I also want to be a blessing to their lives. While they are my students and afterwards - if at all possible. Cause that's what we do. Us teachers. We invest in the lives of our nation's youth. Not just because it's our job but because it's who we are. So let me end this post by saying, if you are a teacher, have a great new school year! Let's go do what we do!